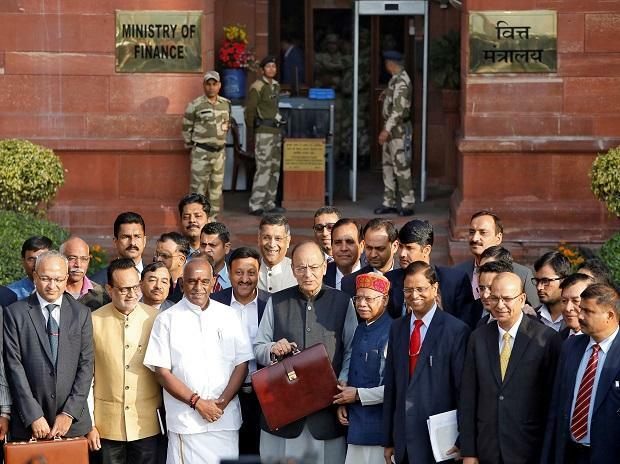 Finance Minister Arun Jaitley (C) holds his briefcase during a photo opportunity as he leaves his office to present the federal budget in the parliament in New Delhi. Photo: Reuters. Shares of companies in the agricultural sector rally after Finance Minister Arun Jaitley unveiled a slew of initiatives for the rural sector, including liberalising exports of agri commodities as part of 2018-19 budget. Government to also raise support price of crops to at least 1.5 times the production cost. Agro chemicals makers PI Industries Ltd, Excel Crop Care Ltd and Monsanto India Ltd rise as much as 4.5-5.5%. Horticulture company Agri-Tech (India) Ltd jumps as much as 10%. Tractor makers also gain, with monthly sales also helping gainsMahindra and Mahindra Ltd up as much as 3.6% to record Rs 790.50.